This is a photograph of my mother Susie Woods, nee Donaldson and my grandad Johnny Donaldson from Loganlea taken at Stoneyburn Park circa 1948. This page was added by Tommy Woods on 14/08/2012. I live in stoke now. I have been away from Addiewell since 1969. I am a lorry driver, I get up to addiewell every other week. My sister still lives in Addiebroonhill - she will have to get the family album out so as we can get more pictures and stories on this site. I lived across the road with my sisters Margaret and Christine. We were pals with Betty and Sadie. I can't believe this is your mum, what a beautiful girl she was. 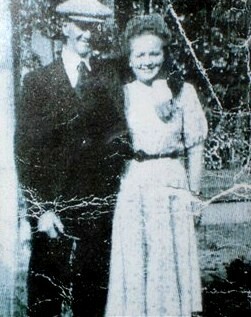 Wow brilliant picture of my granny and great grandad. I wish I had got to know her but sadly it was not to be she passed when my kum dad and me were in South Africa .